I am an electronics engineer and hobbyist. 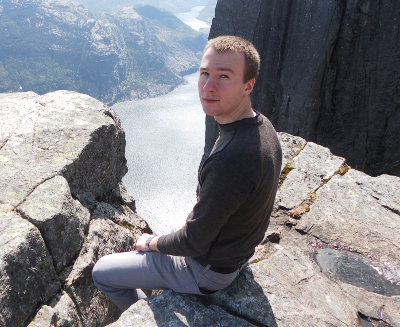 I have a bachelor's degree and over five years of working experience in electronics engineering field. I have designed various electronic equipment for construction, medical, automotive, consumer electronics and oil industries. I was designing hardware, firmware, software and mechanic parts of some devices. I have developed many embedded C applications for STM32, STM8, AVR, ARM9 and 8051 family microcontrollers. I have written test and configuration software for Microsoft Windows, Microsoft Windows CE 5.0 and Android operating systems. In June 2012 probably the first converted Toyota Prius Hybrid "Plug-in" car in Lithuania was introduced to pulic by the company I was working in. I was highly involved in creating the conversion kit for this vehicle from scratch. Article in the press about converted Toyota Prius "Plug-in" hybrid car. In August there was one more published article about the company and Toyota Prius conversion kit. In June 21st 2011 I graduated as bachelor of electronics engineering. During study years I was a good student, had good grades compared to the most of other students. After classes I was working engineering job at university, participating in different exibitions and conferences. 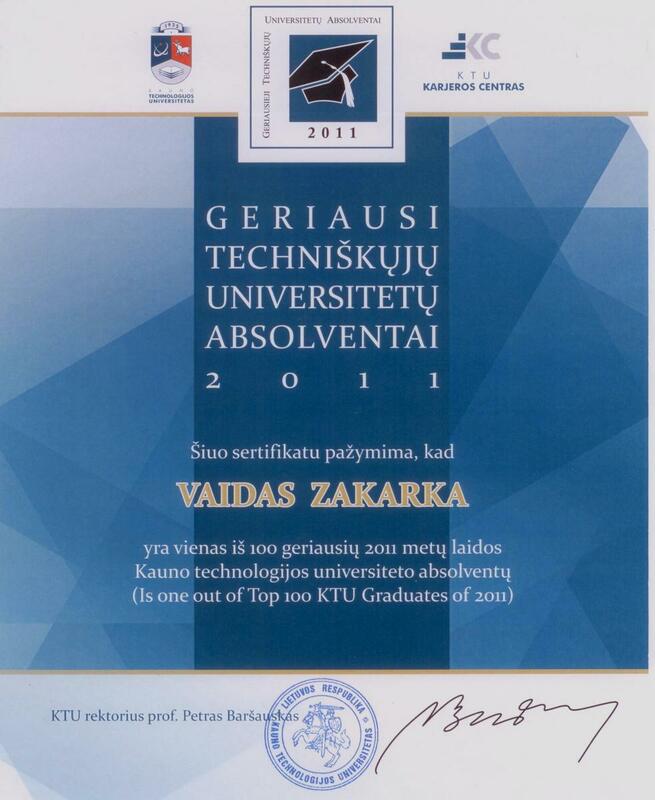 For my achievements I was entitled as one out of top 100 Kaunas University of Technology Graduates. In May of 2010 took part in exhibition "Balttechnika 2010" with two systems I was involved - "Static soil probe data acquisition and visualization system" and "Syringe Pump Integration Device" with Kaunas University of Technology. The exhibition took three days, two of which I was presenting first unique Lithuanian electric vehicle "JonElis" created in the company I worked. 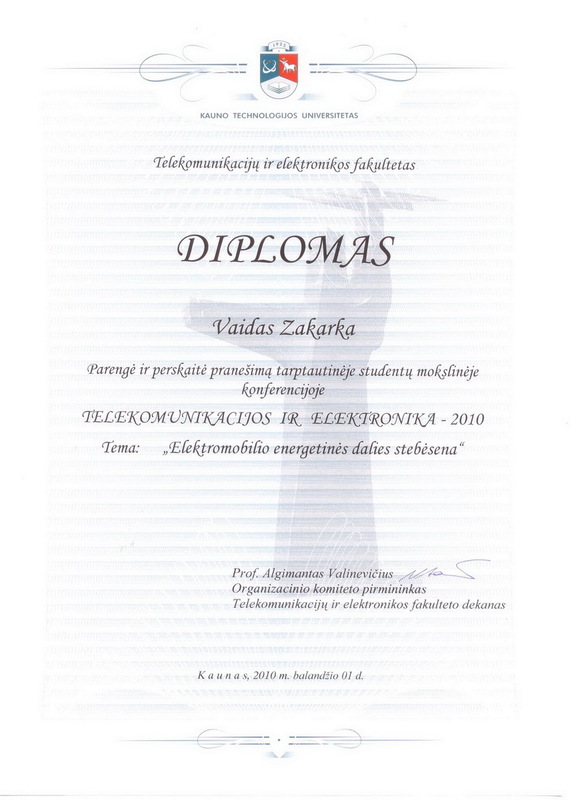 In May year 2010 took part in an annual international student conference "Telecommunications and electronics" held by Kaunas University of Technology. I presented my article "Electric vehicle energetic part monitoring". The article is published in a journal (68-70 pages). 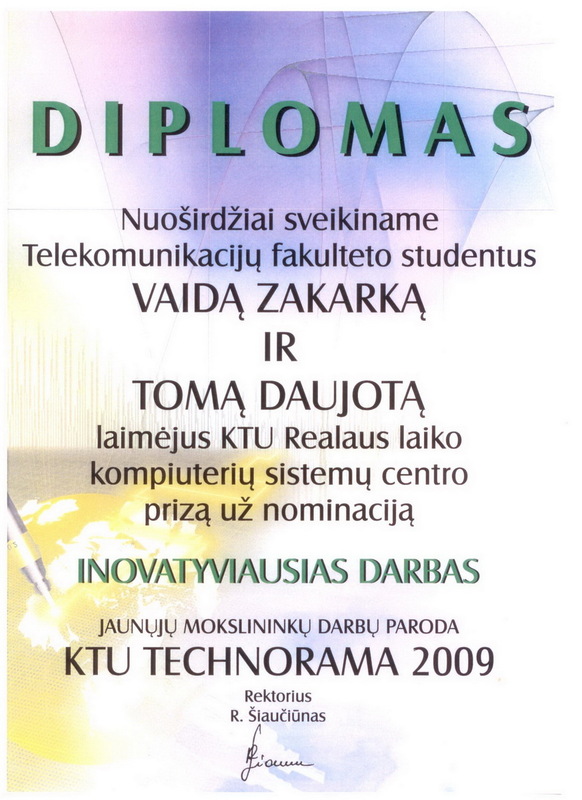 In May 2009 I was participating in student work exhibition "KTU Technorama" with my coursemate and collegue Tomas Daujotas. We presented our work named "Static soil probe data acquisition and visualization system". This work received "Most innovative job" award. There was an article about this exhibition published in the press. 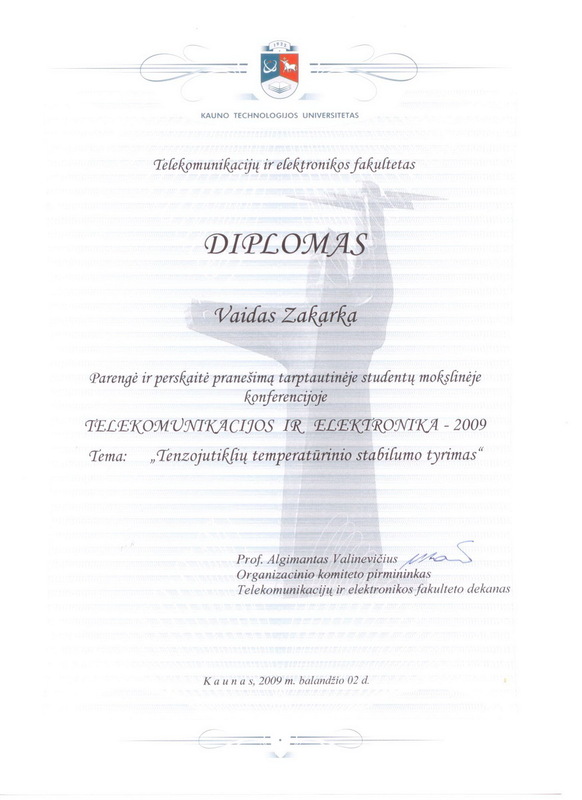 In April 2009 I took part in an annualinternational student conference "Telecommunications and electronics" held by Kaunas University of Technology. I presented my article "Tenzosensors temperature stability analysis". The article is published in a journal (54-58 pages).